Given the state of the economy and the construction market in particular, you’d think that finding a contractor for a tenant improvement project – to fit out space leased from a building owner – could be as easy as picking a name out of a hat. "A lot of firms that haven’t done this work in the past are aggressively bidding projects now,” said John Fuller, a principal in the Boston office of Perkins & Will Architects Inc. Picking the right firm, however, requires more diligence and research. Tenant improvement projects typically require close coordination with building owners as well as the architects and engineers working on the design. Many building owners in the central business district of Boston have a short list of pre-qualified contractors who are authorized to do work in their towers, said Steve Weinig, president of Hamilton Construction Management Corp. in Boston. The most successful projects are often those in which the lead contractor is brought in early as a construction manager and begins working with the design team and the project and building owners before the design is finalized. “There’s almost always overlap in terms of who is responsible for paying for and making decisions on various parts of the project,” Weinig said. Having a contractor involved early in the process can also help if a tenant is seeking to make a project as green as possible. Though existing building systems sometimes limit the extent to which a project can be made sustainable, many tenants now seek to have projects qualify for certification in the interior improvements category of the Leadership in Energy and Environmental Design program of the U.S. Green Building Council. In fact, many large companies are now requiring that office renovations become LEED-certified, Fuller said, whose firm has designed improvement projects recently for Fidelity Investments and the Federal Reserve Bank of Boston. “You have to work with and deal with the limitations of the building systems, but that is something that can be taken into account during the site selection process,” Fuller added. Dan Peruzzi, principal at Margulies Perruzzi Architects, said factors such as reputation and financial resources are essential qualifications to consider up front, but also recommended that tenants take time to get to know the team that will work on a project. “It’s a good idea to know the key personnel who will be assigned to your project, and their individual roles and responsibilities." An interview can help a tenant get a feel for a contractor and how interested he or she is in the job – or whether it’s just a project to hold them over until other types of work become available. 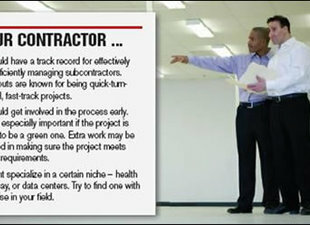 “A contractor that really wants the job will show it and want to prove it in person in the interview,” Peruzzi added.